All the Yes for Arlington yard signs were quickly snapped up by enthusiastic supporters, but we didn’t want anyone to feel completely left out. 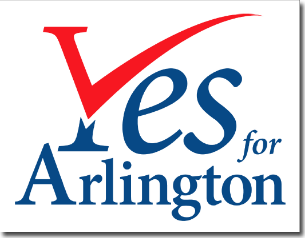 So we created this letter-sized PDF sign you can print out at home and put in your front window, screen door, car, or wherever else you want to show your Yes for Arlington pride! To print: Click on the image or this link to open and print, or right-click to save to your computer and open within Adobe Reader.